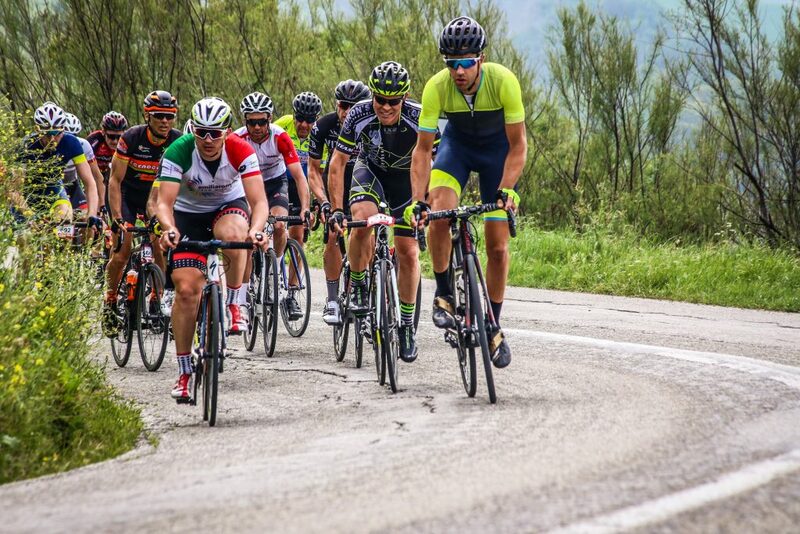 Italy’s Granfondo Via del Sale blends the tantalising flavours of Emilia Romagna with the gruelling training grounds of the late champion Marco Pantani. 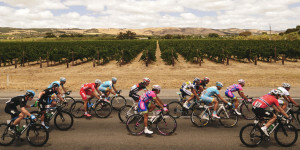 Cyclist digs into a plateful of this wildly challenging sportive. Buon appetito. 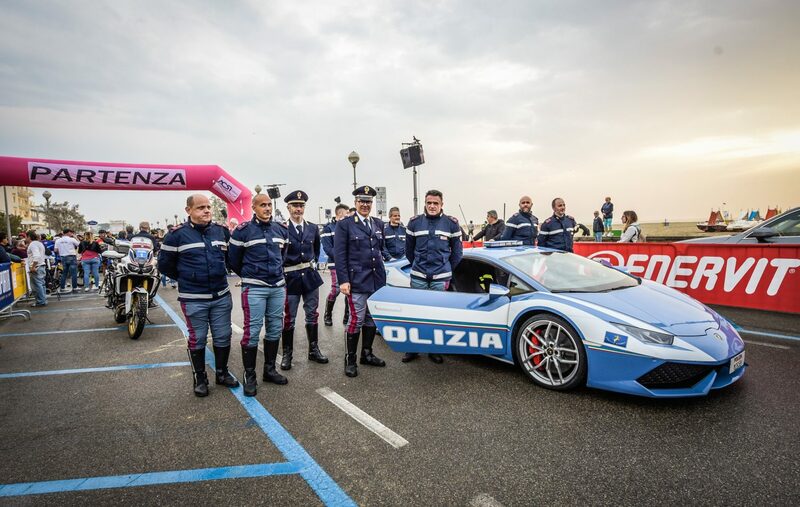 A striking blue Lamborghini, resplendent with flashing police lights, creeps backward toward the first line of riders. 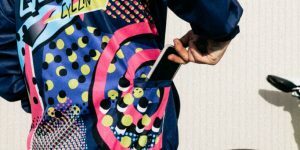 The music, some kind of bastardised Queen meets Euro trash house ­– usually reserved for only the biggest of music festivals – blares from the six-foot-tall speakers. Dawn noise restrictions around Emilia Romagna’s east coast town of Cervia don’t apply today. 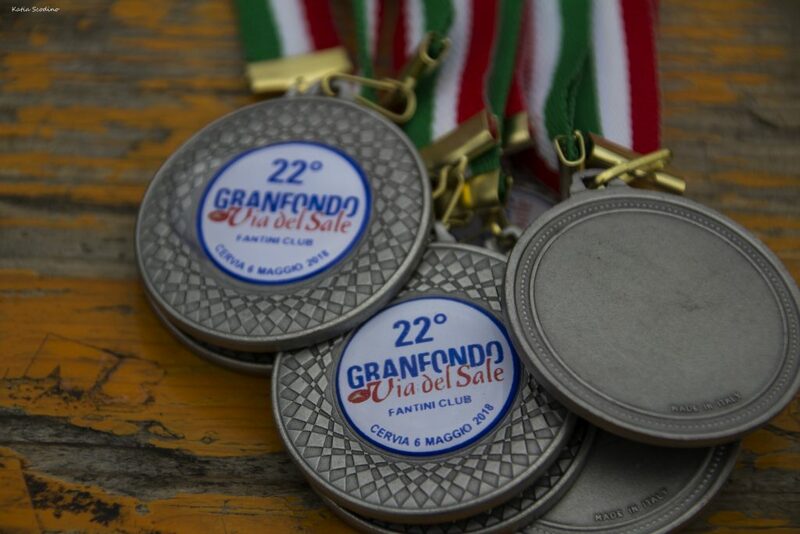 This is the Granfondo Via del Sale, and everything stops for this race – yes I just labelled it so. 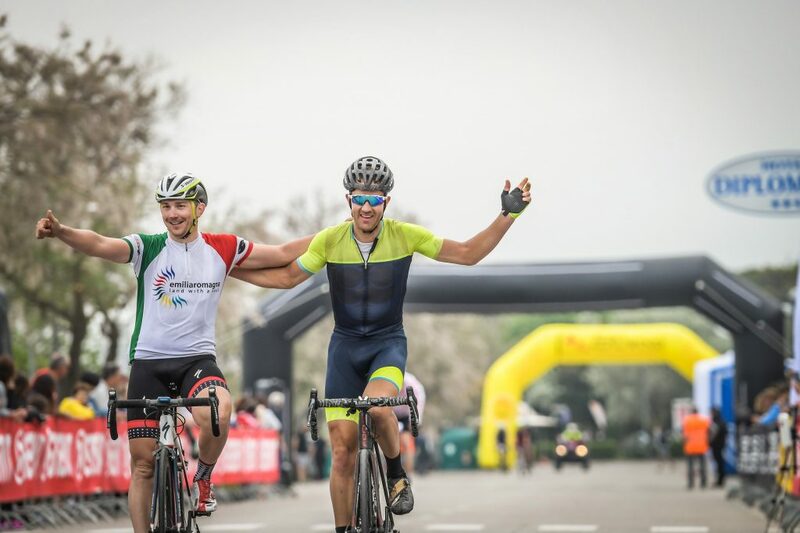 The MC is racing around grabbing vox pops from two-time Giro d’Italia winner Paolo Savoldelli, cycling legend (reserved in this writer’s vocab for only the biggest of stars) Andrea Tafi and bad boy Tour de France stage winner Rinaldo Nocentini. Local star Alessandro Malaguti retired at the end of 2016 but is still very much a champion around these parts. Today, he’s our bunch guide. A swarm of paparazzi buzz around the VIP zone before quickly turning its focus to the gentleman on my left. A single steel bidon, its contents filled with a local Sangiovese I suspect, hangs from his steel bars. 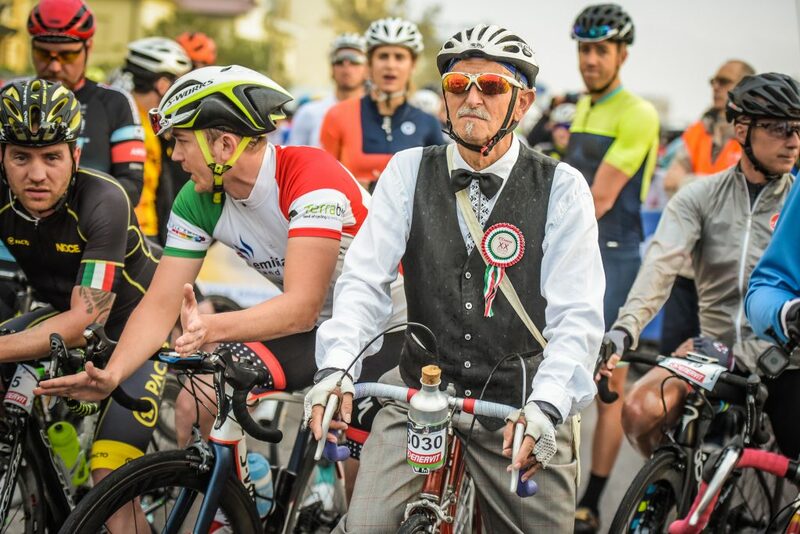 His dress is a classic period piece pulled from the years where many of us find our most romanticised cycling references. I suspect his helmet wouldn’t quite pass the Aussie standards. A drone floats overhead, its pilot stood on a small cherry picker perched precariously over the street. It’s all quite the scene. 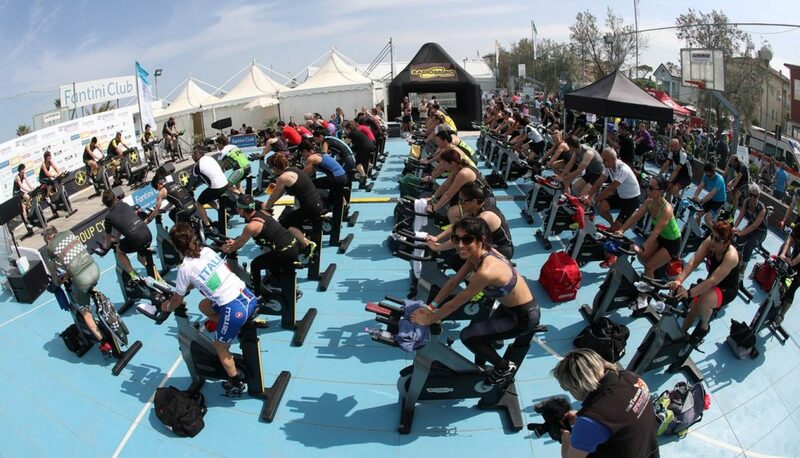 Less than 12 hours earlier, hundreds of riders engaged in outdoor spin classes before Miss Granfondo was crowned – we’ll spare you the gallery. Fireworks capped off the evening shortly before midnight, a welcome relief with our beachside hotel room less than 50 metres away. It already feels like a festival and it’s being delivered at a level rarely found at any sporting event back home. Marathons, swimming events, rugby, footy, AFL, none of them put on a show like this. ‘Race Organiser’ (yep, this sportive is really classified in this way) Claudio Fantini whistles and gestures his cohorts into action at all sides of the barriers. With over 4,500 fluoro-wrapped speedsters anxiously awaiting the kick-off of the 22nd edition, it’s fair to say Claudio has a lot on his mind. 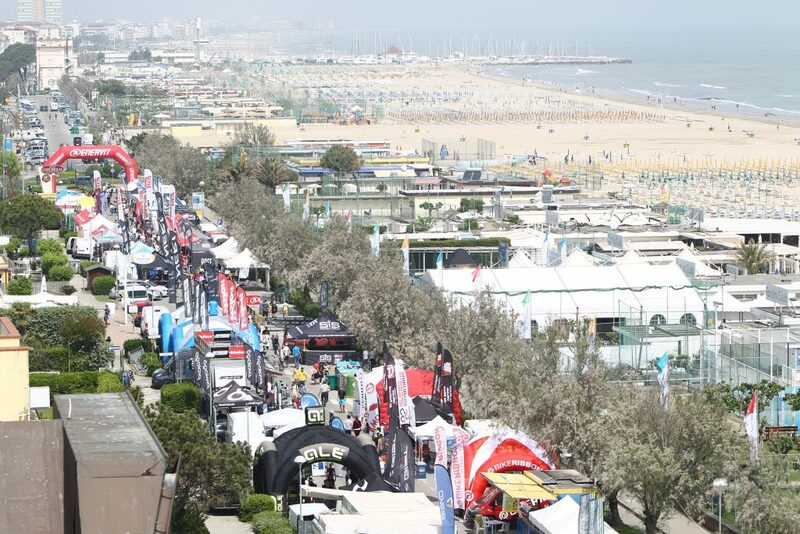 A few minutes ago, Alessandro guided us through the on-street expo to the beachside start in Cervia and onto the second row of the grid. 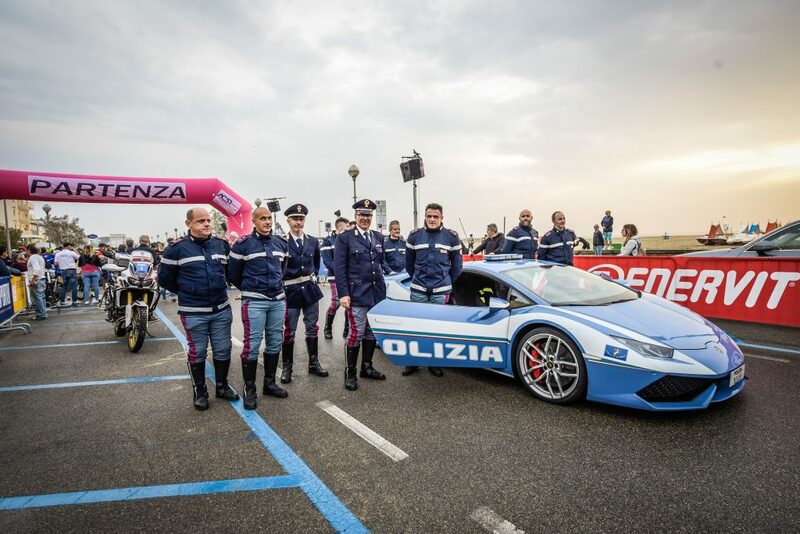 We could have lined up right on the bumper of the Lambo, but with a sea of contestants having likely spent the better part of an hour finding their places into specified ‘yards’, we think our luck is just about at its peak. Besides, Alessandro has already provided a thorough brief as to how the opening kilometres will unfold. ‘This is a race, make no mistake about it,’ notes the two-time Giro finisher turned new father and cycling coach. ‘I have a huge number of athletes here who have all prepared specifically for the race.’ I don’t question his statement. The riders around us look fit… very fit. Yet here we are, sat in the lead pen with less than 30 qualified others while those fenced-in, all 4,500 of them, impatiently jitter to be let loose onto the 170km course. Our route today takes us across the flat farmlands and through the testing hills of the Emilia-Romagna region where the late Marco Pantani spent his training days. This really feels like one of those ‘becomes the hunted’ moments. The lead vehicles launch ahead, Tafi goes on the attack at a rate not even the scout moto can outrun, and the washing-machine of chaos begins. We are off. Racing. The route profile of this Granfondo is quite simple. 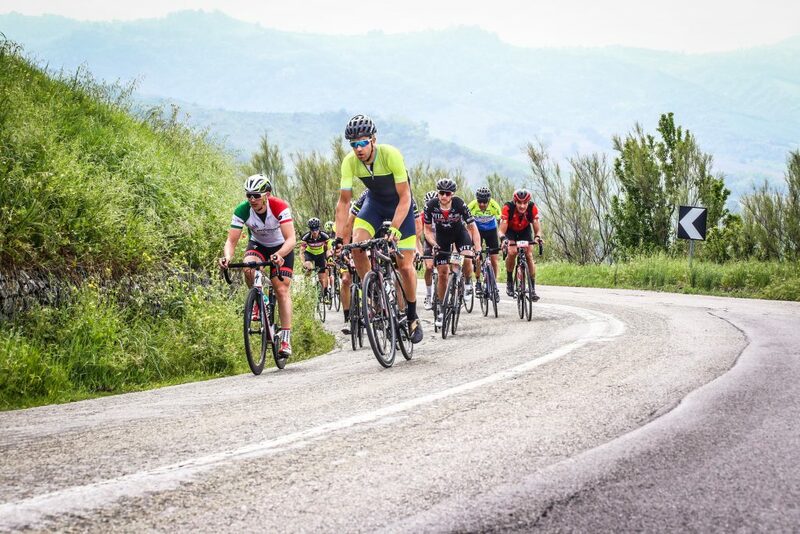 Ride 40km along the battered and pan-flat roads from Cervia and head west toward the hills, complete five climbs of varying length, and finish with a similar 40km of flat to the finish. With the longo touching a little over 170km, my calculations reveal a hell of a lot of climbing within a 90km segment. 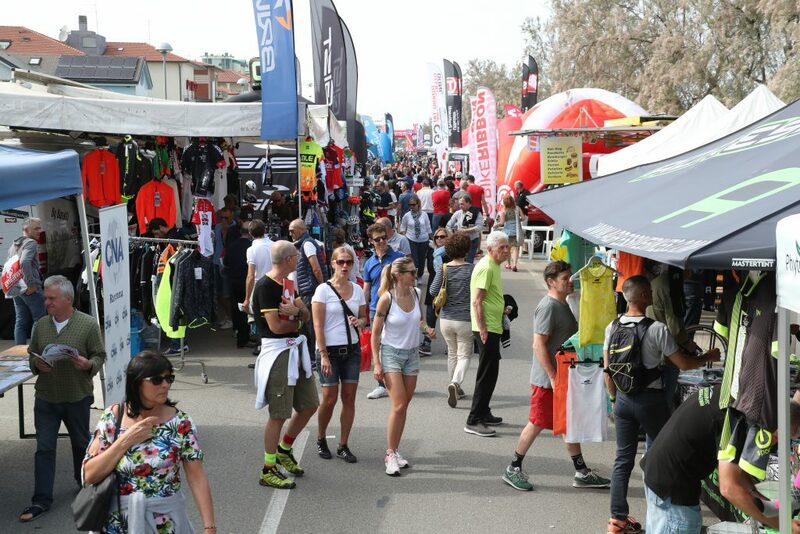 With more than 2,400 metres of elevation across the entire course, one could be forgiven for thinking the Via del Sale is tough but not overly demanding. 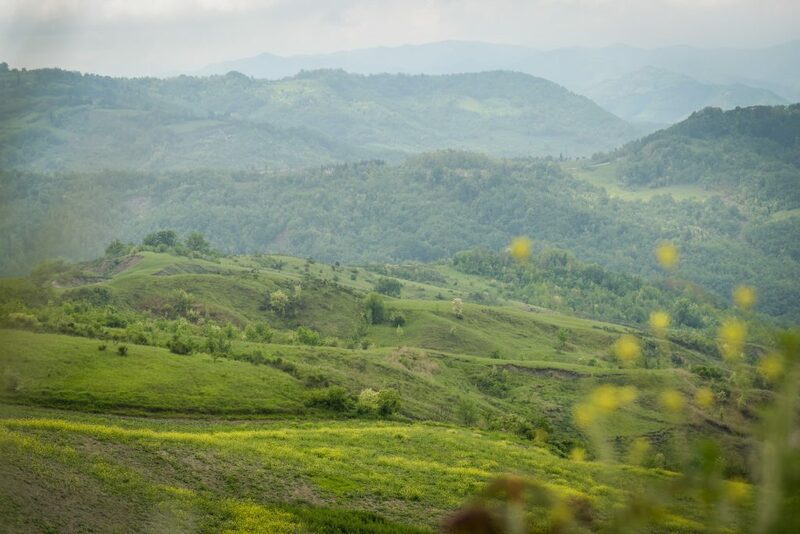 But let’s rewind for a moment: 2,400 metres of climbing in 90km! And when I say the opening and closing are flat, I mean dead flat.  It’s as much a climber’s course as it is one for the bigger riders who can bully their way over the hills and use their power for the flatter sections. All I need to do is survive until the first climb. ‘Move up now, stay with me,’ says Alessandro as we swish around in the bunch at over 50km/h. Behind, I hear the bone-chilling sounds of carbon hitting tarmac, hitting plastic, and hitting metal. I dare not look back. Today, I find myself in the unfamiliar position of being somewhat involved in this race. Unbeknownst to me, Alessandro has signed the two of us up for some on-course interviews with Sky Sports. The cameraman, who should be in front of the bunch, was swamped 30 minutes ago and is now trailing in the wash of riders on the back of a moto. ‘Stay in front of me so I can manage you,’ says an anxious Alessandro. The former Nippo–Vini Fantini rider is playing the perfect chaperone, and with a mass of experience in his legs, I do exactly as he says. ‘Stay near the front until we reach the Monte Cavallo climb,’ he adds. While never a great climber by any stretch, I’ve always backed my ability to position myself when the legs allow it. Alessandro floats about the front 30 or 40 riders, and sighs in relief when I’m just off his right shoulder. While the 31-year-old local remains cool and collected, the same can’t be said for my current state, torn between laughter and frustration. Most of the sportives I’ve ridden are a cafe ride compared to this. Some ‘race’ to the finish, while others aim to finish. Not here. The huge bunch bumps and squeezes its way into and around riders at every occasion. 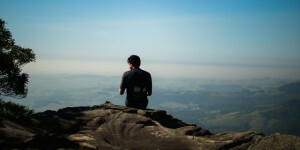 Lose focus for a minute to take it all in and you’ll wake back in the danger zone. The road starts to kick up in Meldola before a short high-speed descent has the bunch tear down a twisty road with little regard for the shower that clearly came through minutes ago. Things are about to get serious now. I muscle my way to the front 10 riders with the hope of sandbagging the first climb and finding my group for the day. I take a huge breath as the surrounding whippets wait for the gate to drop. ‘Alex, Alex, we must wait for the moto. It’s back there,’ screams Alessandro. ‘I’m sorry but we must do the interview on the climb.’ His words need no apology. My heart rate has been near threshold for an hour and a valid excuse to take the first climb at a pedestrian rate is music to my ears. We swing right (this is Europe after all), shift into the 28-tooth cog and watch as the huge wave of riders scurry past. At the speed many of them are going, clearly still pumped from the pre-start soundtrack, I suspect we’ll be seeing (and passing) the majority of them later in the day as the early morning soundtrack is replaced with a slow jam. ‘Ciao, Alex,’ says a cameraman as he pulls alongside halfway up the climb. By this stage both of us have managed to stuff some food in and debrief the opening hour of racing. ‘It’s like nothing I’ve experienced before. It’s a real circus of passionate chaos. And just look at the stage on which it’s all set,’ I tell Alessandro while finishing the rest of my ham-and-cheese Piadina. We fly down the first descent and Alessandro, in true domestique form, pulls one seriously big turn to get us onto the back of a small bunch. He might not train these days, but there’s something about muscle memory us regular folk will never acquire. People talk about cycling having this universal language, and while that might be true, we’re all out here riding – communicating with others is pretty much impossible today. Hand gestures go a little way to getting the group sharing the workload, but for those other times when words are the only option, I just take a deep breath. The next two climbs of the Monte Finocchio and Montepetra take us to the high points of the day. Nothing crazy in the world of proper climbs, but the 600-odd metres above sea level high points and double-digit gradients start to take their toll. We seem to be chasing the rain today, and while dry for now, the views out across the valleys below are shrouded in misty cloud. Our bunch is working well together, but like any good Fondo, there are always those who think they’ll ride away from a 20-strong group despite sitting in the wheels for the entire morning. Ah, to be young. Alessandro has just about run out of muscle memory power and gives me free reign to take on the Cima Pantani, the penultimate climb of the day up Montevecchio. It’s mid-morning by the time we hit the Montevecchio, and while ‘free to fly’, my inner scalatore has long since departed. Instead, I do my best to battle up the five-odd-kilometre climb the former Italian champion made his own by riding up and down to finesse his condition prior to races. Situated 110km into today’s ride, this particular climb gives entrants a chance to go up against the professionals – at least according to Strava. For the record, you’ll need to be on the start line for the Memorial Marco Pantani race in order to have any sort of chance of dethroning ‘The Shark’ Vicenzo Nibali. The only thing we’re racing for is the feed zone at the top which, on arrival, is a sea of people and noise much like the start some hours ago. ‘Vie Alessandro vie,’ screams the hilltop MC as he comes into view and pulls up at the stone monument featuring a framed Marco resplendent in the maglia rosa jersey from his ’98 Giro win. Alessandro looks absolutely spent and dives into all matter of sweet and savoury treats. 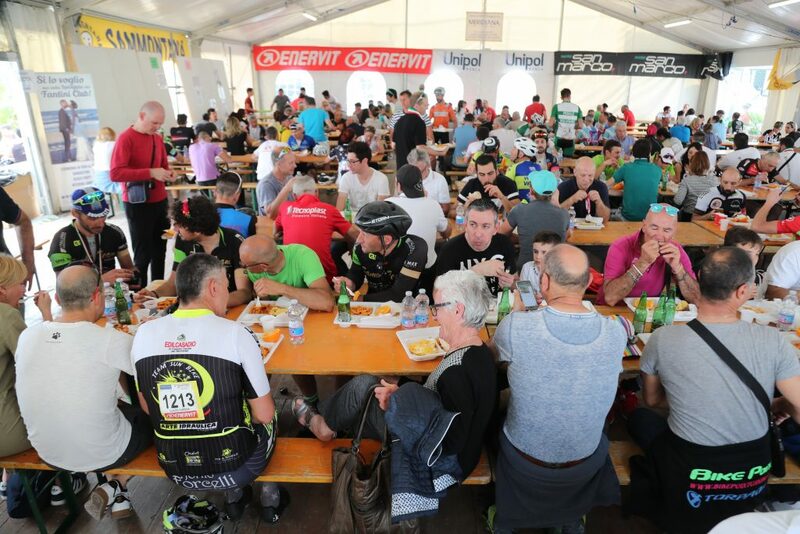 From pizza through to dates and some of the driest biscuits you’ve ever tasted (biscuits are never a good idea when cycling), this feed zone has the lot. A quick refill at the bubbler located next to Marco’s monument and we’re off again. The final stretch beckons. 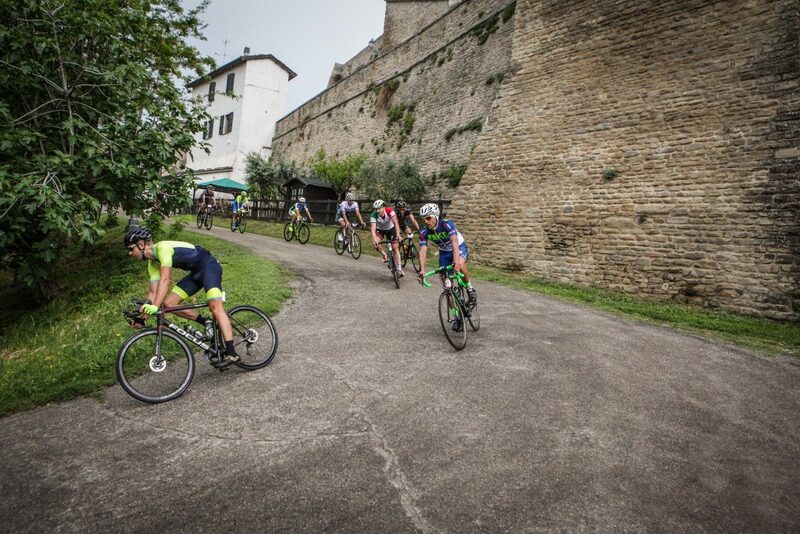 It was back in June 2015 when I first visited the Emilia-Romagna region, and while we visited the Cima Pantani, our pace that day was very much routine. Now, we fly down the twisting descent with a near-180 left-hander at the final bend, which nearly catches out a few riders. We’re still 40km or so from home by the time we cruise over the final Colnello climb and it’s here that we’re greeted with an enthusiastic moto scout. The driver – let’s call him The Stig – is intent on assisting us to the finish. Without a second thought, I place my front wheel as close to his rear mudguard as is ‘safe’ and our bunch speed immediately takes a rapid 15km/h boost. ‘Stay on my wheel until the end,’ I jokingly tell Alessandro. I can tell he’s not overly impressed with this final push to the line, but the ever-consummate former professional knows how to hold a wheel and sticks to the back of my Pirelli like glue for the next 45 minutes. 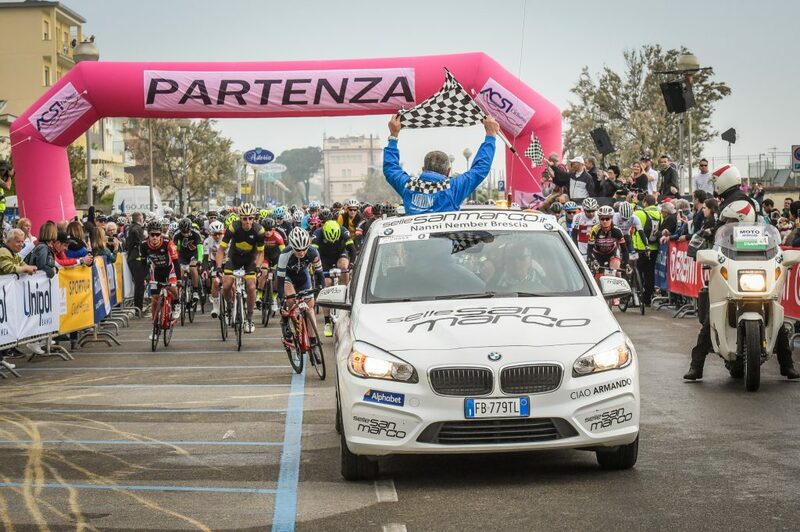 ‘Alex, slow down – now we move to the back,’ Alessandro says calmly just as I start to sharpen the elbows for the final sprint down into Cervia, to the finish line outside the Fantini Club on the Lungomare Grazia Deledda. It takes a while for me to be convinced to again shift to the right and drift backwards, but it soon becomes evident why Alessandro has instructed me to do so. 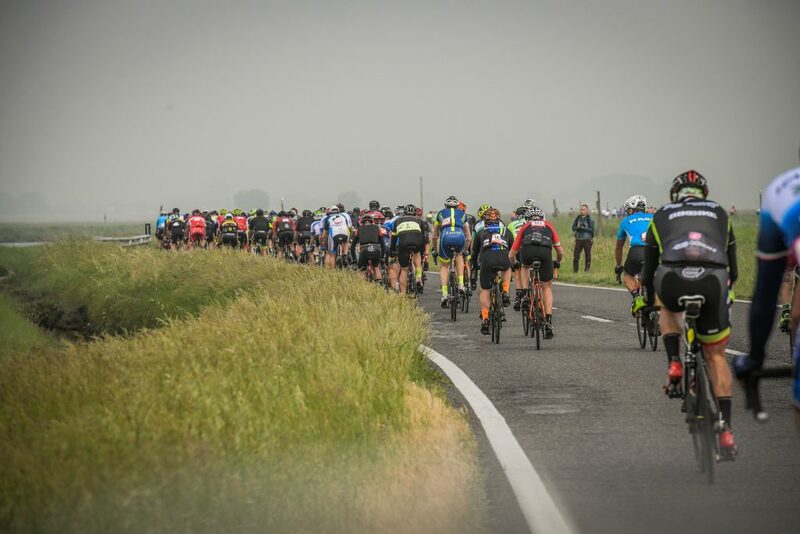 The pace intensifies in the closing kilometres, and while the front of our bunch speeds up, the two of us slowly drift off the back – still at nearly 45km/h. One, two and the last one makes it three… crashes. I shake my head as riders sadly finish their amazing day out by racing for what must be about 500th place. ‘It makes a difference for next year,’ says my chaperone. ‘If you finish with a top time, next year you move up the grid,’ he adds. We take the final left corner at a very gentle rate and cruise into the finishing chute where the party has really kicked off. The music, louder than before, blasts us as we roll over the timing mat and straight into the street-side bicycle expo. Claudio is still running around like mad, but this time it’s with a huge smile from ear to ear. Of course he is – there’s a Pasta Party going on inside the Fantini Club, which he also owns. Now, if you don’t mind, I’m off to triple my carb quota for the day. We flew with British Airways via London and Bologna before utilising a shuttle service to Cervia – around 50 minutes from the airport. Flights start from around $1,200 return from Sydney to Bologna. 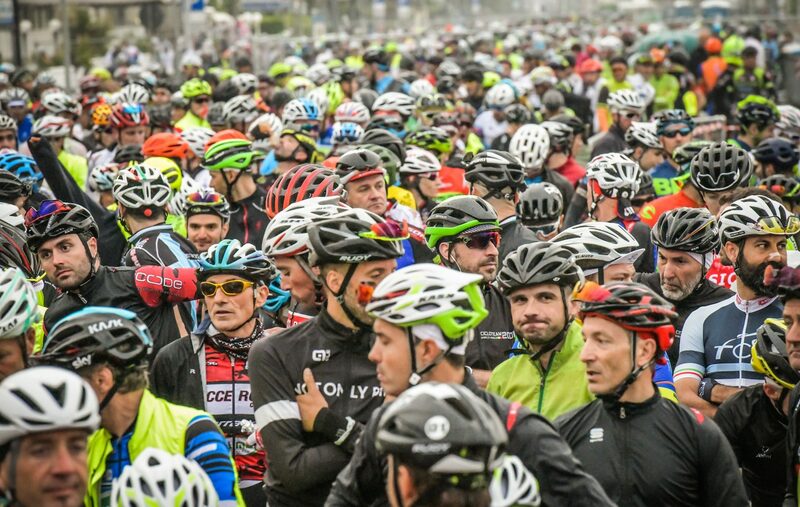 If you’re going to travel all that way for a sportive, it’s worth considering a longer stay, especially if you’re really into the Fondo scene. 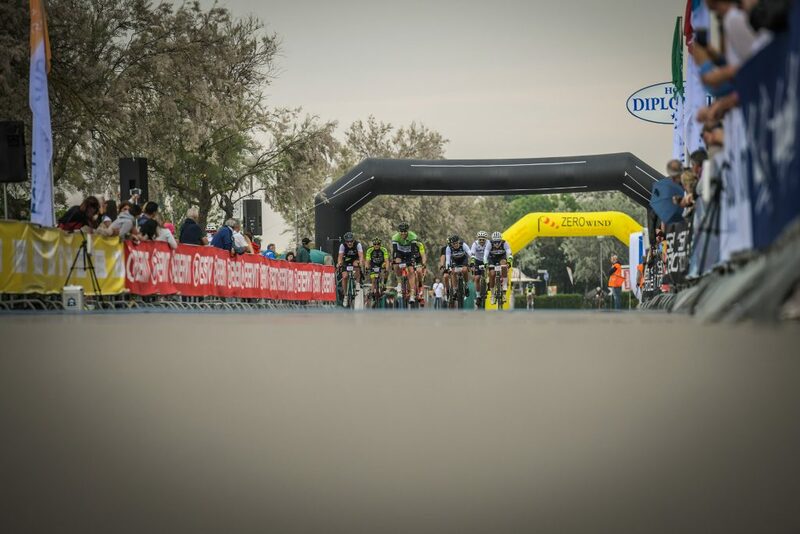 During our visit, there were a number of large sportives all running within a one-month window, with the Granfondo degli Squali and juggernaut Nove Colli all running in May. 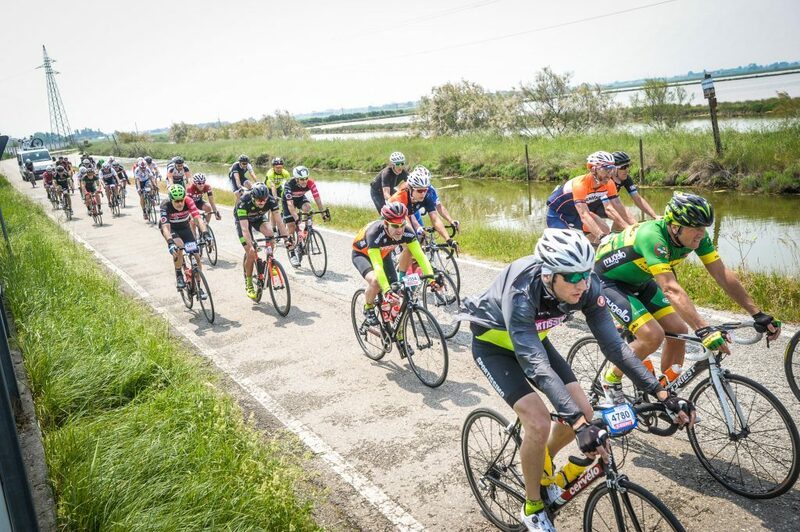 That other race called the Giro d’Italia also kicks off from Bologna this year – so there are plenty of reasons to sign up. We stayed at the Sportur Hotel. 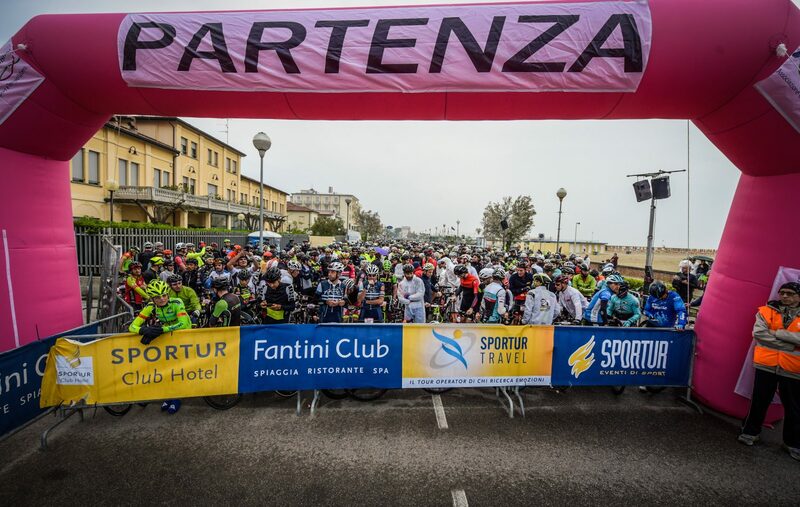 Conveniently located at the start and finish area and opposite the Fantini Club, the three-star accommodation offers well prices rooms with Wi-Fi available in the main lobby area. Expect to pay around $120 per night for two people including breakfast. This region is known for its cuisine and is an absolute standout. 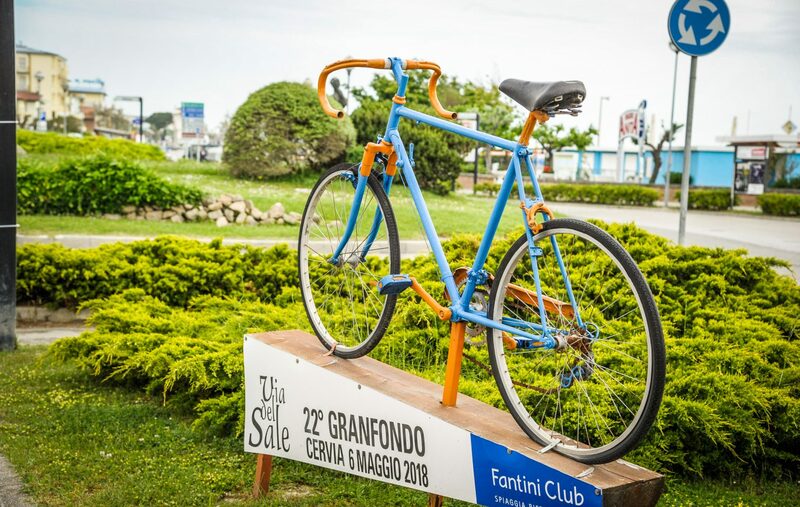 Stroll to Al Pirata for a huge assortment of fish and superb pizza, or take your time when exploring the area by pedal power and drop into Locanda della Luna in Riccione for what was our most memorable dining experience. Just remember, if you’re going to go all in with a carafe of local wine and a couple of shots of limoncello to finish, there’s about an hour of riding before you’ll make it back to the coast. Don’t worry, it’s flat, so you won’t need too much blood in the legs to make it. 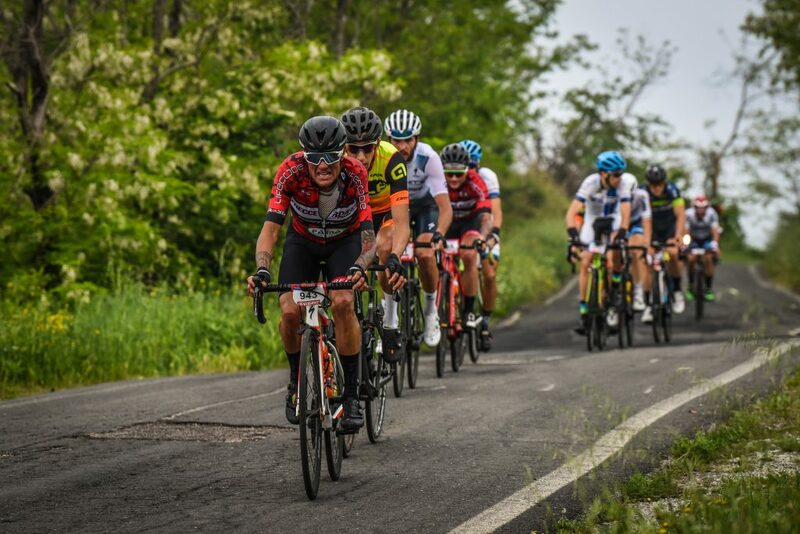 A huge thank you must be given to Emilia Romagna Tourism and Terrabici for the invitation to attend the Granfondo, while the hospitality offered by Claudio and his team at Sportur and the Fantini Club was above and beyond. 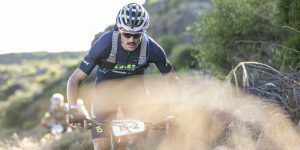 Last but certainly not least, to Alessandro for being one of the best on-bike guides we’ve ever come across. His patience, calm nature and storytelling will remain with us long after the 30-hour journey home.